Sandy plains, prairie-like areas, fields, bluffs, and shores; meadows and swamp borders; oak-hickory forests, mixed hardwoods, cedar thickets; more often in dry habitats than the R. hispidus complex, which is characteristic of moist sites. See comments under R. hispidus. 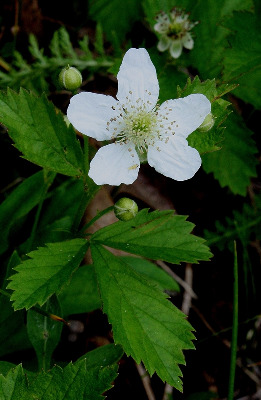 When the prostrate or trailing habit is not known, plants of this very diverse complex may be difficult to place, since the broad-based prickles resemble those of the blackberries. The few-flowered inflorescence, with strongly ascending pedicels, is helpful when well displayed. MICHIGAN FLORA ONLINE. A. A. Reznicek, E. G. Voss, & B. S. Walters. February 2011. University of Michigan. Web. April 21, 2019. https://michiganflora.net/species.aspx?id=2556.